A few weekends ago my husband and I had an itch to build something. We decided on a DIY Tilt-Out Trash Bin! I consulted with my chicken-scratch-never-ending list of project ideas, if you are a DIY’er, then you know exactly what I’m talking’ about because you probably have a list just like it. This trash bin has been on the list for a while. I was looking for something with a little more style than my beige 8yr old rubbermaid trash can. My husband wanted a drawer to keep the trash bags in so he didn’t have to walk across the kitchen to grab them from under the sink. He designed this build from Ana White’s plans for the tilt-out trash can with the revision to add a drawer on top. I’m happy with how it turned out. I just love when style meets function! *The color I used to paint was June Day by Sherwin Williams. Stain on top is Varathane’s Dark Walnut. 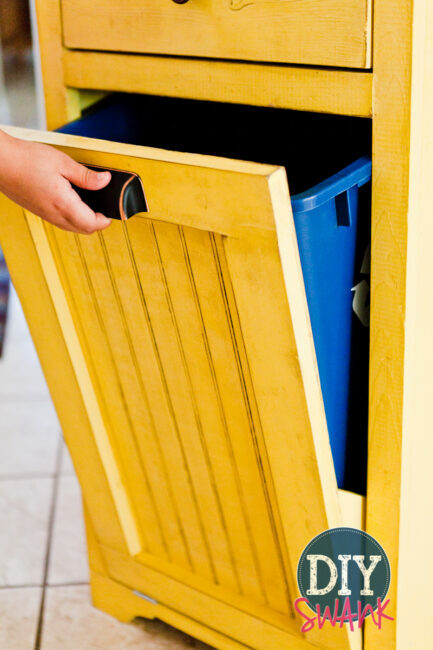 Do you have plans that your husband used to create the drawer addition? Any update on the plans? We are about to start this project and it would be super helpful! Thanks in advance, and nice work!! Hi do you have a any plans you can share for the bin plus drawer? 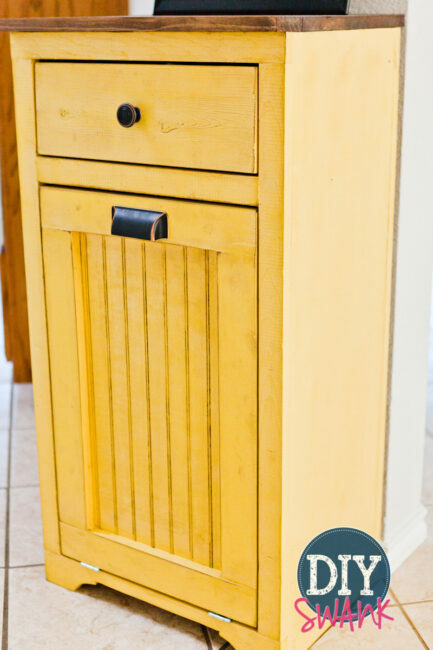 What are the measurements on this trash can holder? Also, interested in plans. Thank you. I also would love a copy of the plans with the draw addition. Lovely! May I have a set of plans? I would also like a copy of the plan/instructions! Thanks! Looks awesome! Well, the drawer is a BIG hit! I too would love the plans with the drawer if it becomes available. I would also like a plan to your trash container. I really like the drawer addition. I love the modification with the drawer. Are the plans available, I would like a copy please. If available could you email me a copy of these plans…thanks! I LOVE this trash bin! I would also love the plans when you have them available. Would really appreciate the plans, I’d available. Thank you! Please email me plans for this if you have some. I am good at building things but not designing them. Please email me with plans for your trash can! Thank you so much. I would love this plan. can anyone provide it? Also, interested in plans with the drawer addition. Please email me if they are available! Thank you. I would really appreciate any directions/plans that you could send my way. I love your design! Thanks! Love the drawer! Would appreciate any plans you have! Would like to see the plans without the drawer. Looks great! I am about to start building one myself. Can you please forward the plans that you have. Thank you! Could you send me a copy of the plans really like the trash bin but I too would like the drawer. I would LOVE the plans with the drawer! Can you please send them to me?? Would love the plans, too. 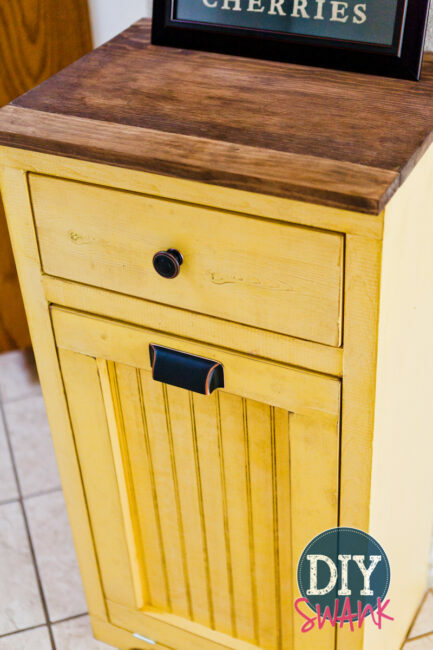 I love the look of this one and love the fact that it has a drawer to hold the trash bags, etc! I would also like a copy of the plans if available. I would also love to get a hold of plans with drawer. Please! Do you have plans for everything, including the drawer? This is exactly what I’m looking for!! has anyone received plans for this yet? I’d really like to have them. Email or post, either way let me know how to get them. Thanks. Megan … Did you husband happen to draw up his plans for the bin w/ the addition of the drawer? If so, may I have a copy emailed to me? Are plans available yet for this? I would like to get the plans with the drawer please. Perfect! If you have time, can you forward the plans to me too. Thank you! ? This is exactly what I need in my kitchen! I’d love a copy of the plans for this, if they’re available. Can you please send me a copy the plans for this as well. Thanks! I would love to have the plan for the drawer addition as well! Please send! I would love to have plans for this along with the drawer addition, also. Please send!! I would really like the plans with drawer addition. I would love these plans with the drawer addition. Would you be able to send them? I want to make this for a house warming gift. Could you please send the plans with the drawer addition? This is so beautiful!! I would love a copy of them. Have y’all posted the plans with the drawer addition? Please email if you have. Looks like there’s been lots of interest in the plan. I’m pretty handy if I have even basic plans. Thanks! I see everyone is asking for plans. Do you by chance have any? Did anyone ever get the plans for the pull with the drawer?